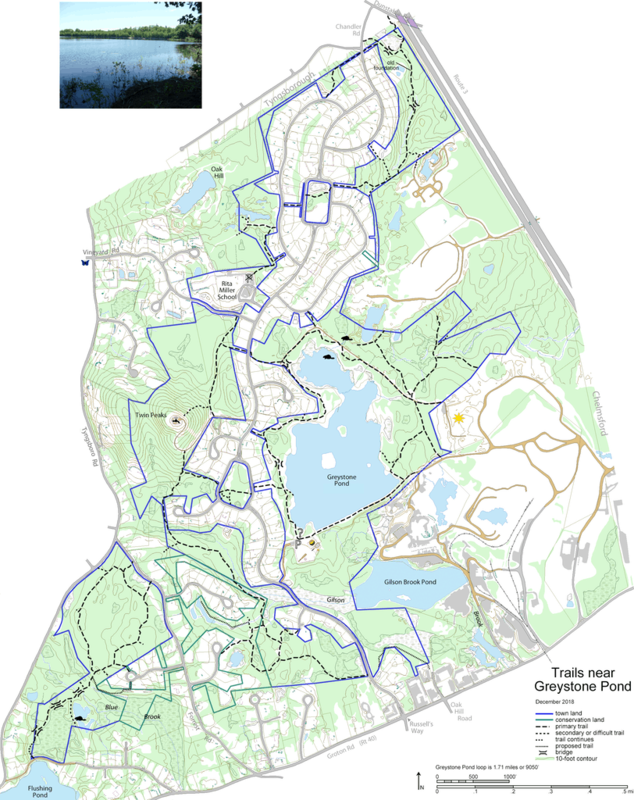 The Greystone Pond and surrounding trails offer a diverse panorama of northeastern woodland and wildlife. It stretches from Groton Road and Flushing Pond in the south west to Dunstable Rd and Route 3 in the northeast. There is ample parking at the playground located before the first rotary on Russell’s Way. At the playground you will be at the southwest corner of Greystone Pond. This is an excellent starting point to explore the pond and handiwork of our local beaver population. You also will find a large assortment of water fowl nesting and enjoying the pond, perhaps a colorful Wood Duck or later in the summer the white crescent of a Blue Winged Teal. The southern end of Greystone Pond has an earthen dam with a wide walkway. The walkway allows an easy access to the eastern side of the pond. Once on the east side of the dam you may want to take a side trail to see a large Solar Park, one of the first privately owned solar parks in the northeast. Located on the west side of Greystone at the first rotary on Russell’s Way you will locate the trail heading up to twin peaks. This is an excellent walk to one of the Westford water towers. This is an exceptional vantage point to catch your breath and enjoy a summer’s day and glimpse an occasional Broad Winged Hawk from April through September. Descending north towards the Miller School you will notice the Glacial till of rock deposits in the most amazing arrangement of large boulders balanced on each other as the glaciers retreated years ago. Exploring northeast across Russell’s Way is a trail running north in a heavily wooded section along a cool running stream in a wooded habitat. There you will find the remnants of an eighteenth century quarry with several piles of cut stones, the perfect habitat for a Red Fox to burrow under for a winter den. Further north you will discover an old rock foundation with a firebox built into the back wall. The possible date of the structure could be in the 1700’s with the beginning of home construction from Chelmsford settlers. There are several foot bridges on this trail to keep your feet dry as you cross the streams in the north east section. Click a parking or hiker icon for directions. Click and drag to scroll.